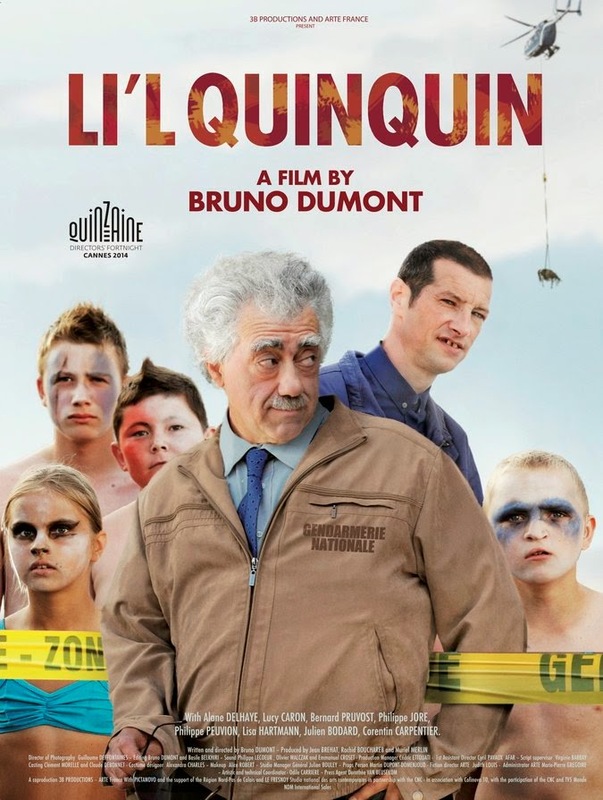 A bucolic seaside town in France is rocked by a series of bizarre murders, starting with a double homicide in which the victims' body parts are found inside the carcasses of dead cows, in L'IL QUINQUIN. Captain Van der Weyden (Bernard Pruvost), his face a constantly contorting ball of tics, heads up the investigation. His driver and foil is Lieutenant Carpentie (Philippe Jore), who treats every car trip as an excuse to try out his stunt driving skills. The captain is bothered almost as much by a group of bike riding adolescents led by Li'l Quinquin (Alane Delhaye), a racist juvenile delinquent whose only redeeming quality is his love for neighbor girl Eve (Lucy Caron), as he is by the gruesome nature of the murders. To him, both are equally signs that the world he's living in is the Devil's domain. Since LI'L QUINQUIN is actually a four part TV series that has been stitched together as a feature film for export, it is a bit on the lengthy side (just over 3 hours). Writer/director Bruno Dumont allows the plot to unfold at a leisurely pace, taking ample time taken to introduce the characters and the setting they inhabit. The overall tone is deadpan and darkly humorous, with a number of laughs being the sort that you might feel a twinge of guilt about. For almost all of the cast, this is their first film or TV credit, but everyone works together really well as an ensemble, with Pruvost and Delhaye rightfully standing out the most in the lead roles. Many have compared LI'L QUINQUIN to Twin Peaks, and at the risk of seeming lazy I'd have to agree, although by the time its over the film has taken on a distinct flavor of its own. There's more of an edge to the eccentric characters, and there's none of Peaks good natured attitude in the dry satire of small town mentalities here. Unfortunately one thing LI'L QUINQUIN does have in common with Twin Peaks is a frustratingly vague ending. At least David Lynch was good enough to tack on a resolution to his television murder mystery when he recut it for a theatrical release in Europe. If I were watching this on Netflix and had a reasonable expectations that Season 2 would be on the way with some answers eventually, no big deal. There's still a great deal to savor and enjoy watching QUINQUIN play out like a feature film, but its hard to deny the disappointment of investing 3 hours in the film only to go home without seeing the mystery solved. 3 out of 4 stars. It resembles a satirical treatise of self-reflection, functioning simultaneously as a summation of Bruno Dumont's thematic interests over the previous two decades and as a bonkers remake of Humanité.